What is Work in Hand? horse in preparation for such movements as piaffe, passage, and high school maneuvers. Why Consider Adding Work in Hand to Your Ground School? First, to accomplish a dance in this intimate position with your horse, with grace and finesse, is a beautiful and spiritual experience. Second, it is wonderful preparation for skills you will be requesting on-board. 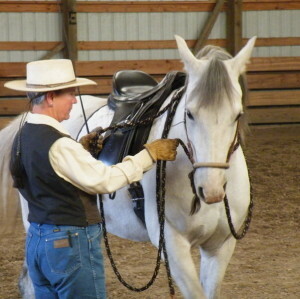 Third, often times work in hand is not easy to accomplish for either horse or human, and therefore it helps to develop a positive attitude, in good posture when achieved. The sense of accomplishment is the reward! Finally, work in hand provides opportunity to learn ‘feel’, through establishing the ‘feel’ or ‘suggestion’ in the outside rein, the ‘feel’ of moving in balance, and the‘feel’ of effortless communication.